For generations, Dumond’s Custom Furniture has been a symbol of quality craftsmanship and lasting value. Each piece of furniture is meticulously handcrafted from only the finest woods and finishes. Whether you decide to purchase one of the custom made coffee tables for sale below or you decide to have a custom coffee table made to fit your personal style, you can rest assured knowing that your new furniture is built to stand the test of time. Custom coffee tables, slab tables, organic shaped rustic tables, natural edge tables, end tables, hall tables, nightstands and accent tables made to order and many in stock as well. Unique, unusual, one of a kind designs. Size 24″ W X 36″ L X 20″ H.
Size 20″ W X 28″ L X 17″ H.
Custom coffee tables, slab tables, rustic tables, end tables, hall tables made to order in Montana by Dumonds Custom Furniture. Unique, unusual, rustic one of a kind designs. Size 53″ W X 56″ L X 20″ H.
Unique, unusual, one of a kind designs. These custom slab tables made in our solar powered wood shop in Montana and shipped worldwide. FOR SALE NOW!!! Unique, unusual, one of a kind designs. Unique custom coffee tables handmade in Montana. Many unique tables on sale now. We design and build all of our designs in our solar powered shop that is completely off the grid. Beyond that, our unique furniture pieces are handmade from reclaimed and recycled urban wood slabs. Now you can have eco-friendly furniture that will last a lifetime and look fantastic in your space. Rustic, unique, unusual, one of a kind designs. Custom coffee tables handmade in Montana in our solar powered wood shop. Call today for sale prices on our one of a kind unique coffee tables. THIS ITEM IS FOR SALE NOW!!! Custom coffee tables, end tables, hall tables, nightstands and accent tables made to order. with trestle base and walnut shelf. Unique wood slab custom coffee tables, end tables, hall tables and accent tables made to order and many in stock. Unique, unusual, one of a kind designs. Unique, unusual, one of a kind designs from end tables to 22 foot long conference tables, we build it all. Our furniture is handcrafted by Paul Dumond who has over 25 years of experience building custom wood furniture. Our furniture is handmade in our solar powered shop using recycled and reclaimed wood slabs. You won’t find eco-friendly furniture like this anywhere else! Rustic slab custom coffee tables custom made in Montana. Do you have a spot in your log home or cabin for a handmade rustic coffee table? 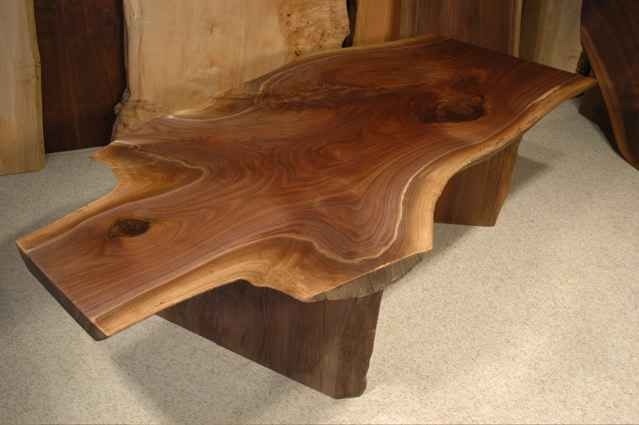 Large slabs of hardwoods make great table tops, desk tops and bar tops. 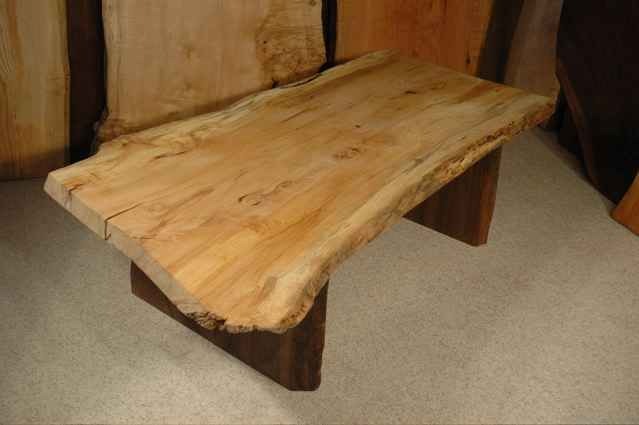 A rustic slab table would look great in your new log home or cabin. This rustic furniture is custom made to order. Unusual rustic furniture-slab walnut custom coffee table. This elegant walnut slab table has a beautiful swirling grain that you will appreciate every time you use this wonderful table. Handmade rustic furniture made to order. Custom coffee tables, end tables, hall tables, nightstands and rustic accent tables made to order. and much more, made to order. Rustic furniture made to order. One of a kind recycled Russian Olive custom end table with Ebony Butterflies and a Cherry Base 24W x 70L x 18H. Place your order today, only one available. Many different designs can be built to order using unique reclaimed wood slabs of cherry, walnut, oak, maple, and more! 30W x 23L x 18H. Place your order today, only one available. Our custom wood furniture is built using solar power and eco-friendly reclaimed urban wood slabs. Place your order today, only one available. Many unique designs made with live edges. Our eco-friendly furniture is built using reclaimed urban wood slabs. These slabs have some of the most unique grain around. Siberian elm recycled custom end table. 24W x 62L x 18H. Place your order today, only one available. Call and ask us about some of our unique custom coffee tables also in stock and available today! One of a kind, rustic knotty walnut coffee table with Cherry Base 24W x 48L x 18H. Place your order today, only one available. These are one of a kind custom coffee tables! Rustic, One of a kind, walnut custom coffee table with Cherry Base 24W x 48L x 18H. Place your order today, only one available. Rustic, One of a kind, Knotty Cherry Custom End Table with Cherry Base 24W x 48L x 18H. Place your order today, only one available. One of a kind, rustic Maple Custom End Table with Cherry Base 19W x 52L x 18H. Place your order today, only one available. At Dumond’s Custom Furniture, we build everything by hand. From the table bases to the table tops themselves, everything is hand worked to perfection. No two coffee tables are the same and each has its own unique character, shape, and dimensions. If you find a custom wood coffee table that you like, we might have it in our warehouse available for purchase. If it is still available, then it could be shipped to your doorstep within a few weeks. If the piece of furniture you like has already been sold, we can custom build a similar piece just for you and have it shipped to your doorstep within eight weeks. If you’re looking for a custom built wood coffee table to fit your home or office space, we can help you out! Let’s say you already have an idea in mind of a custom wood coffee table that you would like to have. You can submit your idea to us via our Request A Quote Form or call us directly at (406) 777-3772. Just describe the type of table you’re looking for, the size, shape, wood type, and any examples that you might have and we can give you a custom quote. From there, it takes a few weeks to build the table itself by hand but once it’s complete, it will be shipped to your doorstep within a few weeks.